Psuedo Elvis, Faux Marilyn | Nan Tubre Writes . . . I have just about come to the conclusion that most men want to be like Elvis Presley and most woman want to be like Marilyn Monroe. I’m going out on a limb I know, but this is just my own observation. Maybe I don’t get out much. I don’t know. You tell me. For those of you who have read my book Secrets of the Old Ladies’ Club you may remember the scene when the mysterious new resident of the retirement village is outed. His give-away is his famous (self-proclaimed) rendition of How Great Thou Art, circa Elvis Presley, which he performs from the church choir loft. I know you are thinking that could never happen, right? It happened. And not only in the book. It happened in REAL LIFE not once but TWO separate times. First of all, you should know that I MAY have patterned the character in my book on someone (or two or more) I actually MIGHT have known at one time, a man, shall we say, who imagined himself channeling Elvis from the choir loft. It was a good impersonation too, but the tinkling of the piano keys sounded a little lone-star-country-bar-ish. I fully expected to hear the clink of glasses (or beer bottles) after the dismissal. Thank God I didn’t. Keep in mind I MAY be exaggerating. Or not. At any rate, I turned that experience into a great scene for the Old Ladies’ Club. I never expected to ever be confronted with that situation again. After all, it’s fiction, right? Sure. 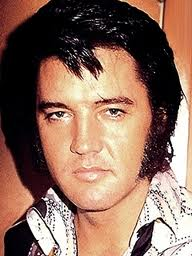 Let me just say that I know more than one man who fancies himself a new age Elvis. Dear God in heaven, (seriously, not irreverently) please don’t let that happen again. If I could, I would give you dear readers all of the scary details about another hopeful who wanted to gift an unsuspecting congregation with his own impersonation of How Great Thou Art, as per Elvis, during a funeral, an act that would no doubt mortify every single person in attendance especially the straight-laced pastor who had a tendency to frown upon such unsolicited displays of talent. I was drafted to be the one person to put a stop to it before it started. I must add that pseudo Elvis dearly loves the grieving family and would do nothing to hurt them. He just over estimated his abilities … and his wife’s reaction. As for the aforementioned effort to put a halt to the show, just know that it wasn’t pretty. But nobody, I repeat nobody in the church had any idea of the ensuing concert manifestation or cancelation. Whew. Rest assured we made up later although it was touchy for a while. We’re still friends. Please don’t think that I’m foolishly above all. I’m not. Obviously I have huge flaws. And I’m not trying to pass judgment on anyone. I’ll put it like my husband does: Won’t they please let Elvis rest in peace? Faux Elvis is just not the same. Thank God for His everlasting mercy and forgiveness! I’ll keep working on my flaws, my sins, my uncanny ability to (wrongfully) pass judgment. And I’ll keep asking Him to forgive me every time I fail because I know Who is King, Just, Right, Fair, Forgiving. And Everlasting. I really like that everlasting part. As for the Marilyn Monroe remark. Well, I just threw that in there to be fair to the guys. I’d like to be Marilyn Monroe. Not BE her exactly, but look like her. Yeah, I’d love to look like her. She sizzled! Now that takes talent! Yes, to all the Elvis wanna-bes, I am a Marilyn wanna-be. So there. Don’t hate me for it. But please stop me if I ever put on a see through dress and start singing Happy Birthday Mr. President. Will you take a moment and pray for peace? And for the kidnapped girls of Nigeria? And for victims of Mother Nature? And for a cure for cancer? And for His will to be done on earth as it is in heaven? I love it. But I have to admit I am not a Marilyn want-to-be!!! Bathroom acoustics are the best audience you know… Lol!